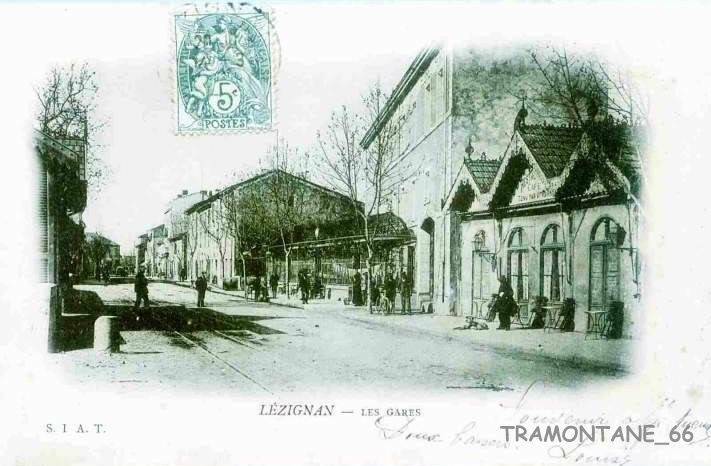 In the image below, the tramway continues behind the ‘Cave’ which ids the low long building on the right. 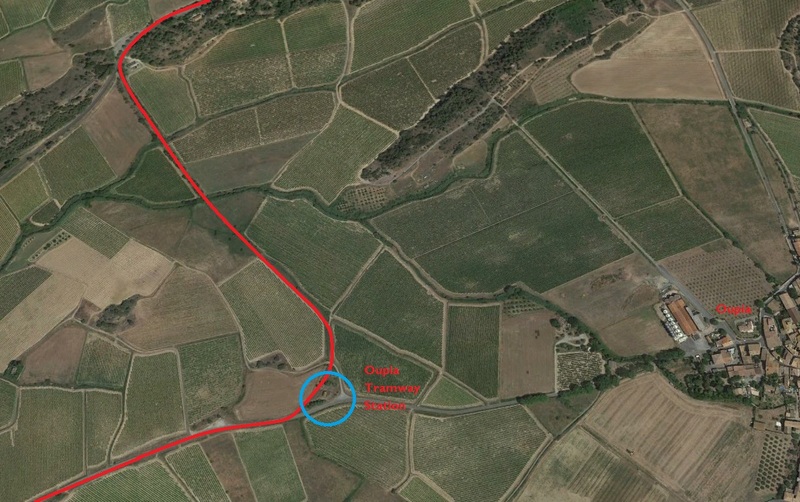 the Tramway alignment is running parallel to the IC68 (D168) which can be found on the south side of the ‘Cave’ and is shown in the second image below. 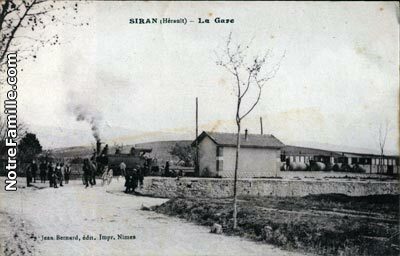 From Siran, the Tramway travelled on the Northside of the IC68 (D168) to Cesseras. 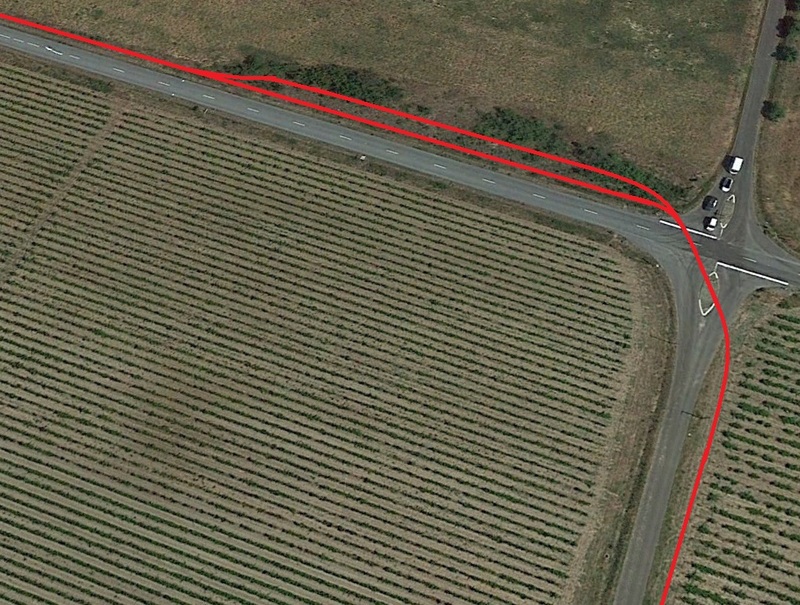 As far as I can ascertain, the tramway ran on a raised embankment on the North side of the road, as shown below. 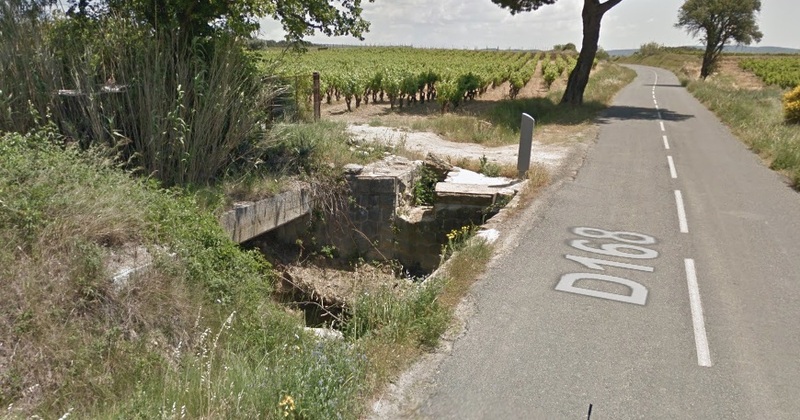 This image shows the remains of a tramway bridge over a stream. Old abutments and one beam are visible. 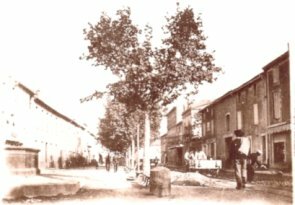 The approach to Cesseras. 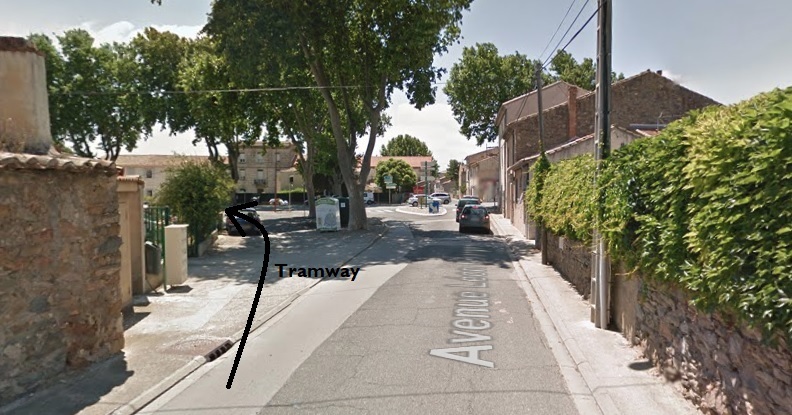 The tramway is still on the north side of the D168 (IC68). 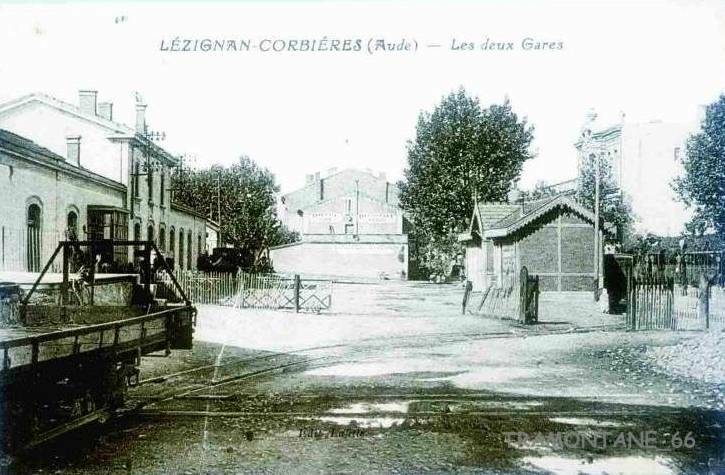 The slight embankment to the left of the road shows the tramway alignment. 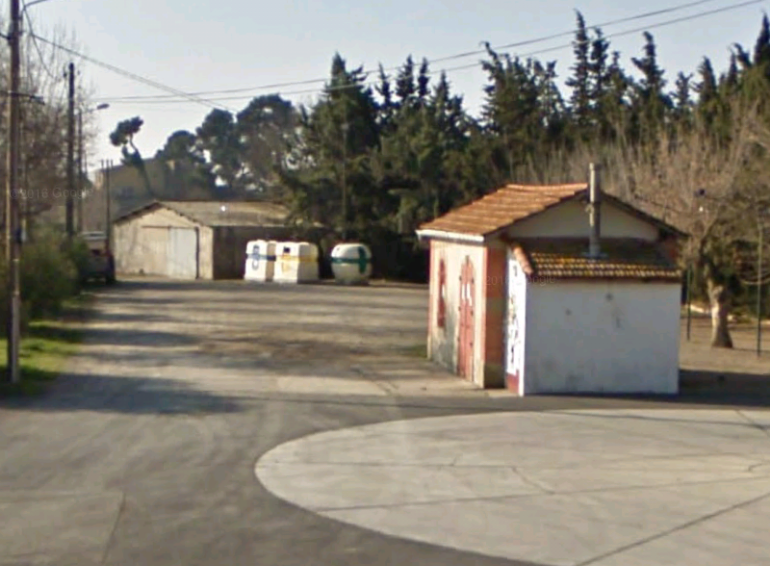 The station at Cesseras is just beyond the building ahead on the left of the road. 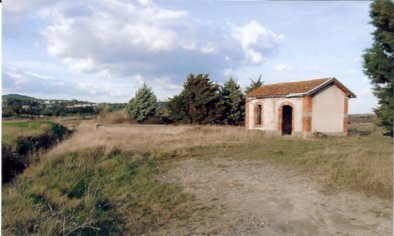 A hundred metres or so closer to the village the old station building can still be seen in the early 21st century. 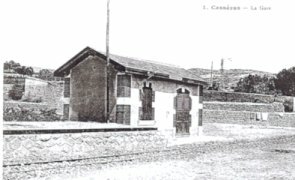 The Tramway Station building in Cesseras was encountered just before the trams entered the village. 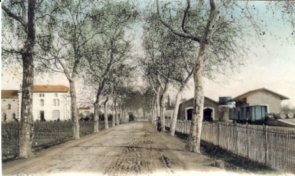 The image above attempts to produce a similar view to the adjacent earlier image. The platform has been removed and a bench provided. 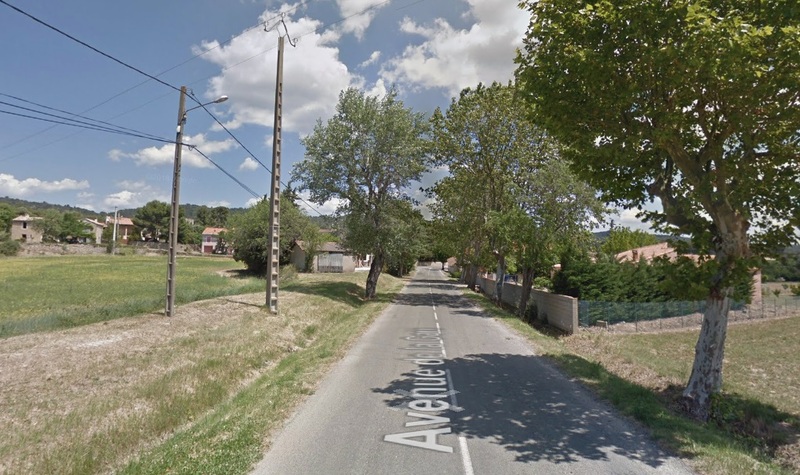 This view looks back from Cesseras towards Siran. 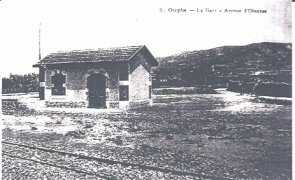 A similar view of the station building in the early 21st century. 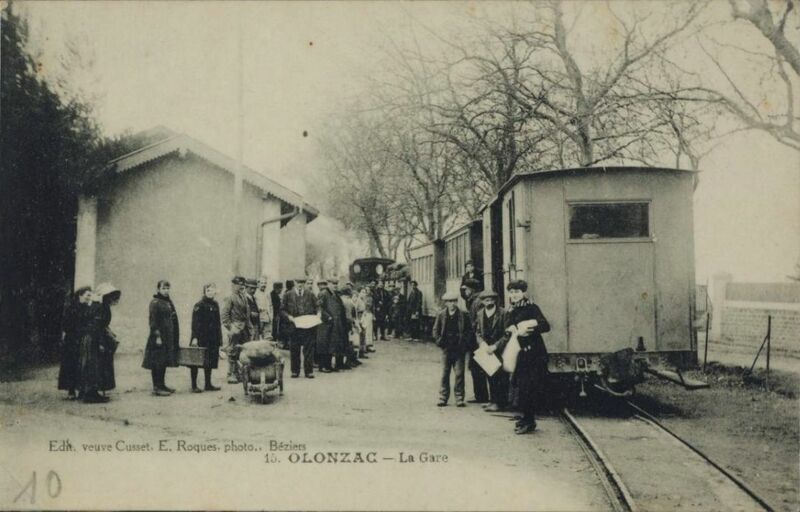 On the way to the station of Oupia, trams crossed two girder bridges with 15 metre spans over the streams of Oupia and Escut. 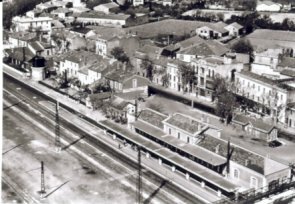 These bridges were demolished and sold in around 1948. The abutments remain . 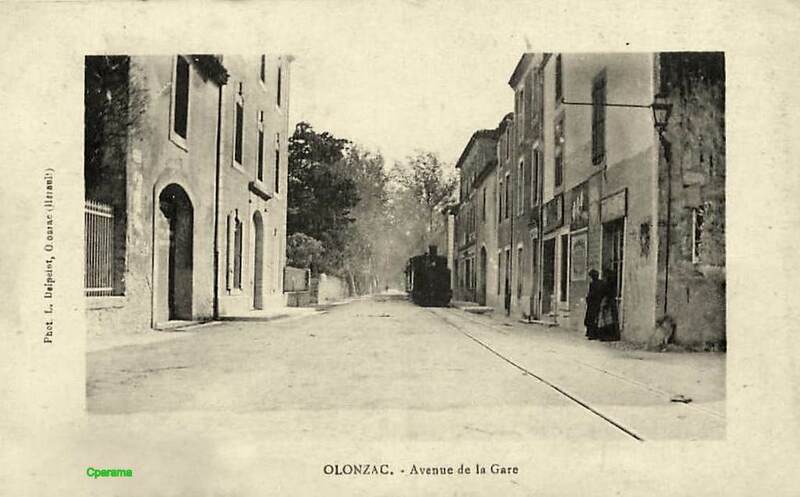 After the station the tramway followed the route of the modern D52E2 towards Olonzac. 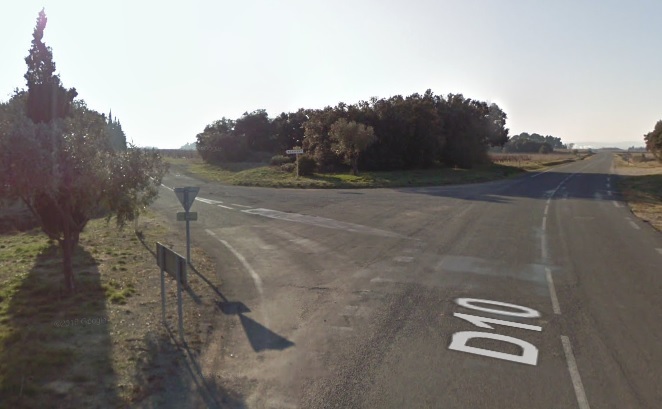 Nowadays there is a roundabout at the point where the tramway encountered the GC20 (D910) at its junction with the GC70 (D52). 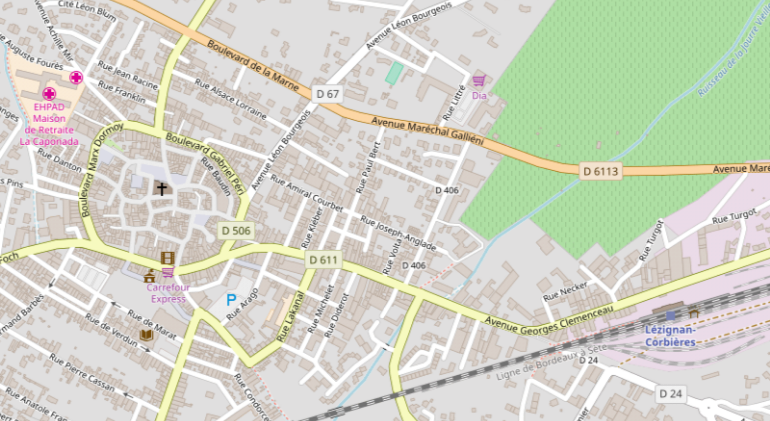 The green line on the satellite image above approximates to the route of the tramway arriving from Beaufort, Cesseras and Siran. 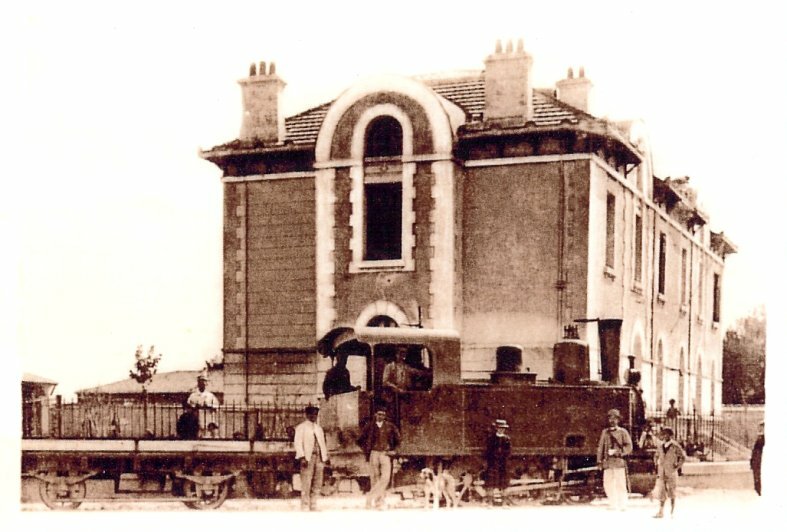 The next three historic images show the more southerly station in use. 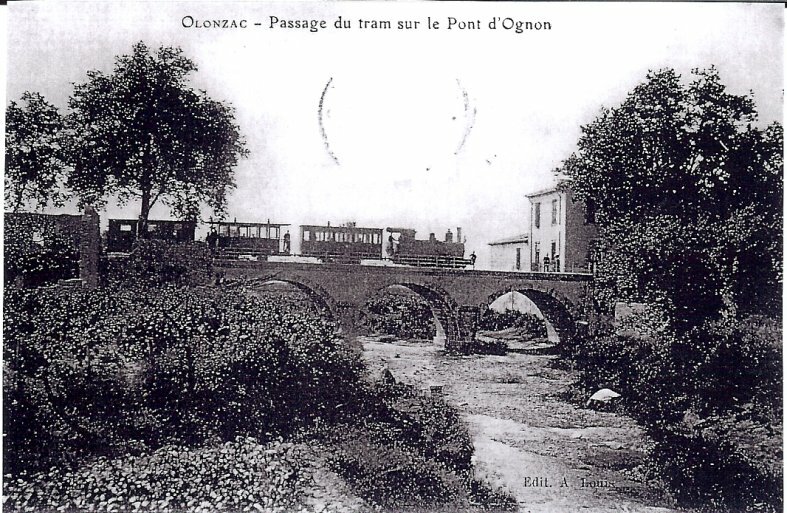 After leaving the main Station in Olonzac, trams soon crossed the River Ognon on a masonry Arch Viaduct as below. 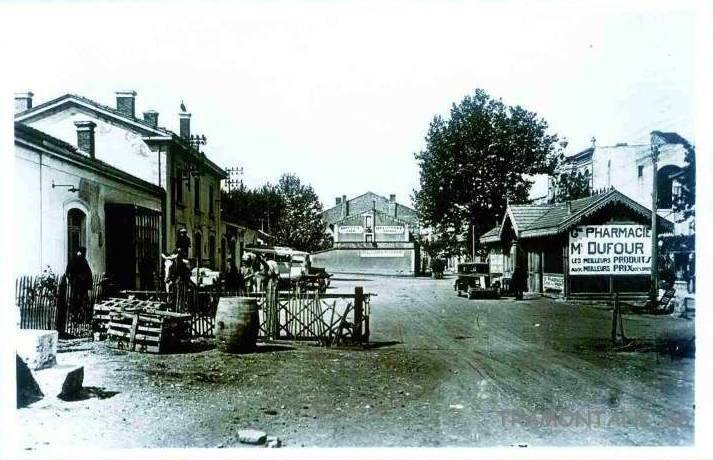 The viaduct was close to the town distillery, it was a three-arched road and tramway bridge, each arch was of 8 metres span. 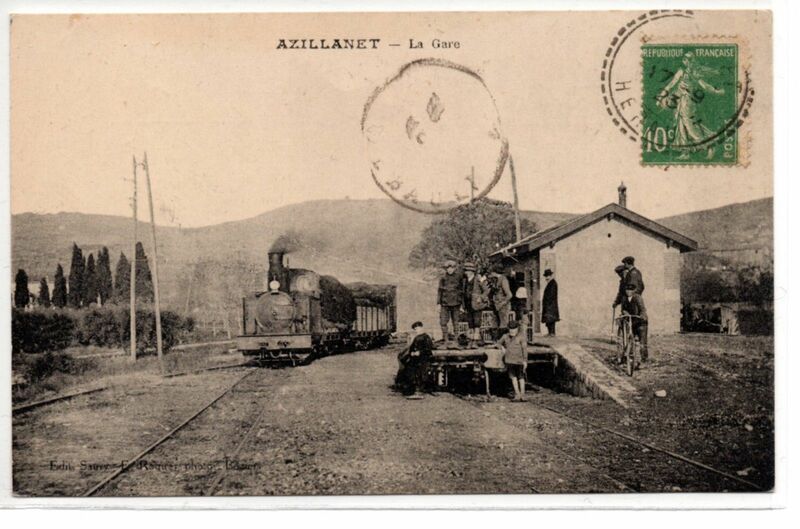 The line has now turned southwards and as it leaves Olonzac soon exits Herault and returns to the Aude. It follows the GC10 (D910) to the departement boundary, and then the D2560 into Homps. 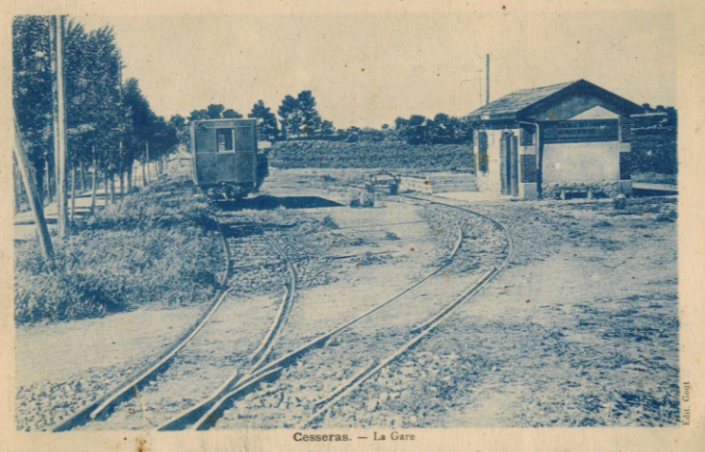 Just before reaching Homps the tramway and the road which is now the D2560 crossed the Canal du Midi. 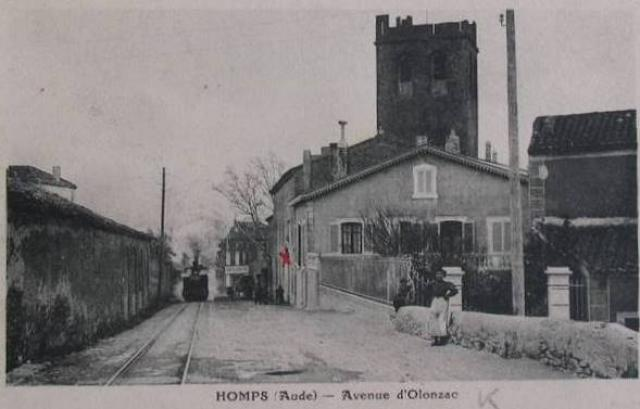 Like Olonzac, Homps has grown since the days of the tramway. It stretches along the South side of the Canal. 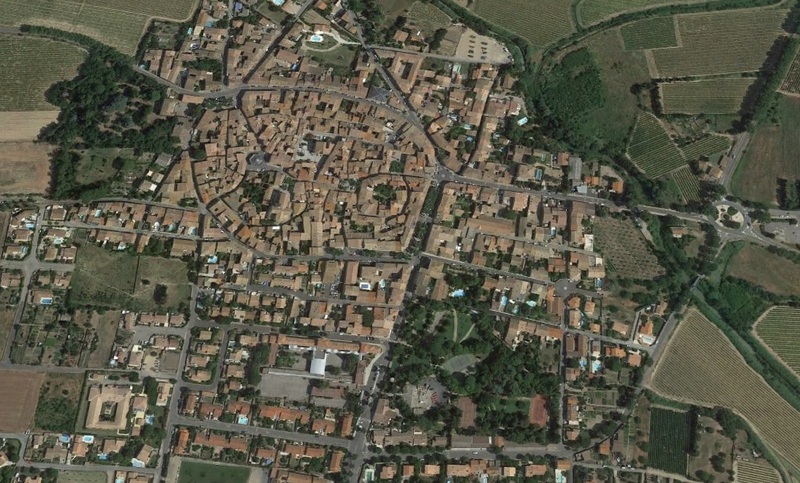 The picture below is a satellite image of the village and Canal. 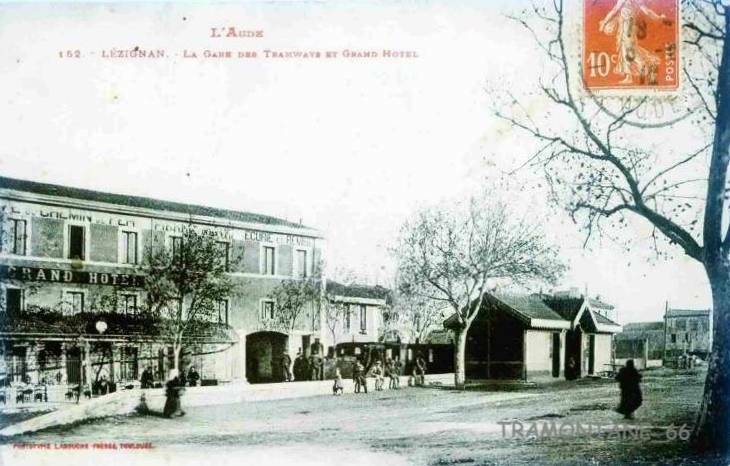 The Station at Homps was on the North side of the Canal du Midi. 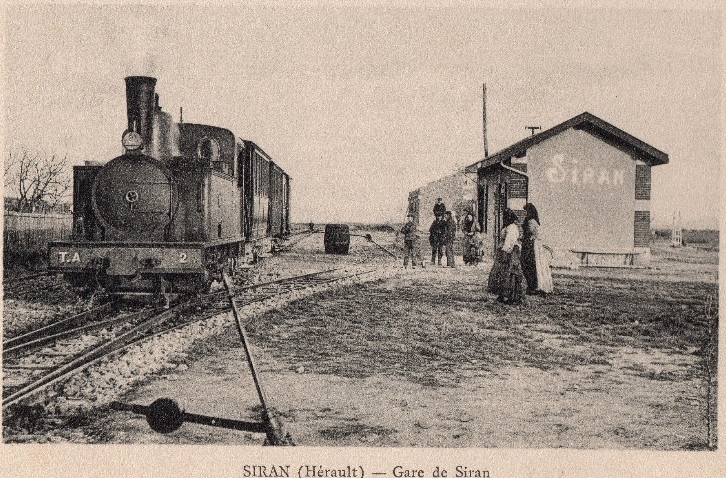 It was a three-track station alongside the GC10. 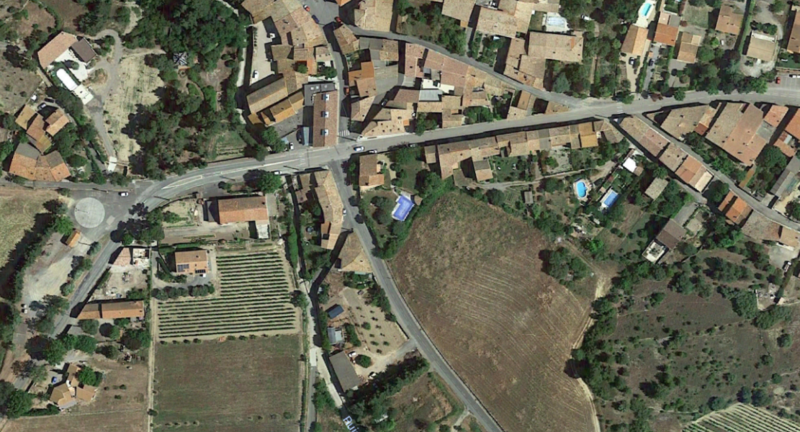 The location was at the top of the image below and to the right of the main road. 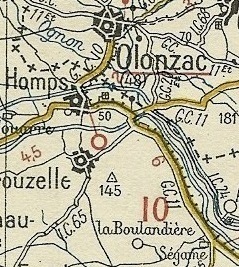 The route from Olonzac enters the satellite image at the top and then curves round to pass over the Canal. This image is taken from the end of the retaining walls on the North side of the Canal. 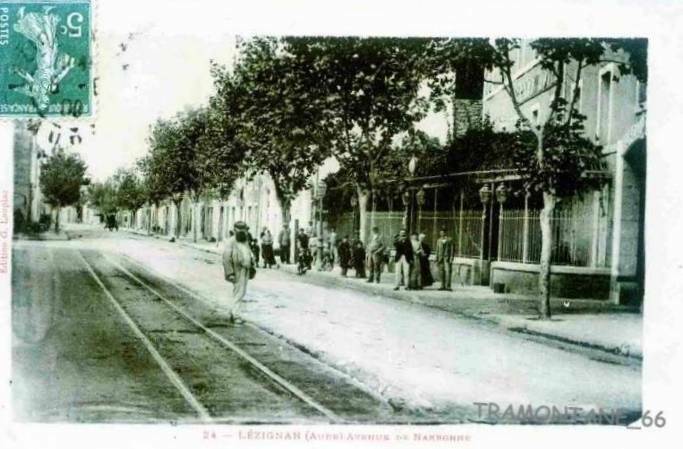 It shows Avenue de Minervois, looking towards Olonzac. 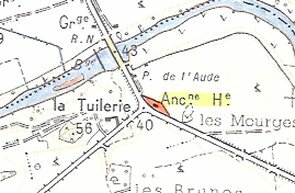 It shows the location of the Station at Homps. 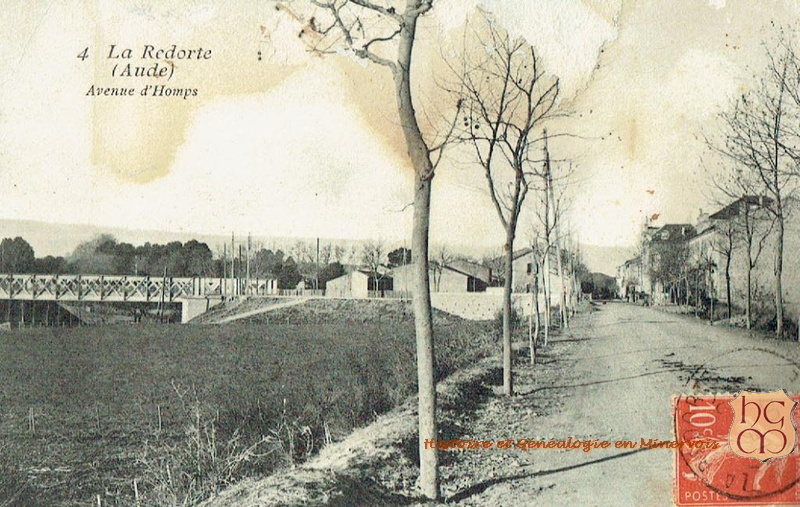 The earliest bridge over the Canal du Midi was a lattice girder bridge of the type seen in La Redorte, on the left of the postcard below. 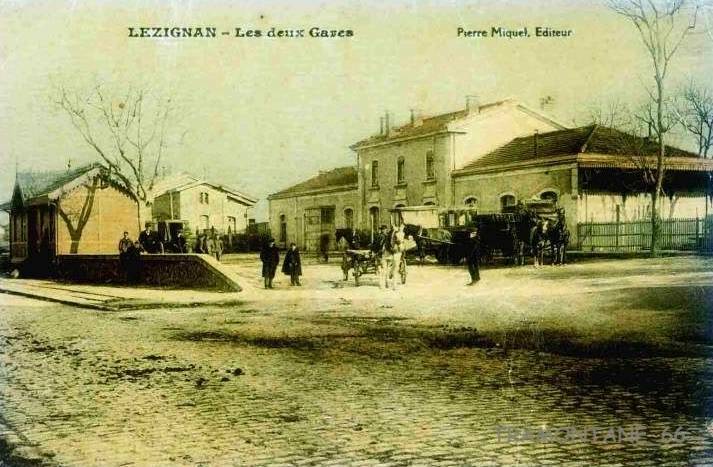 The later replacement Canal bridge was a substantial structure as can be seen in the adjacent old postcard image. 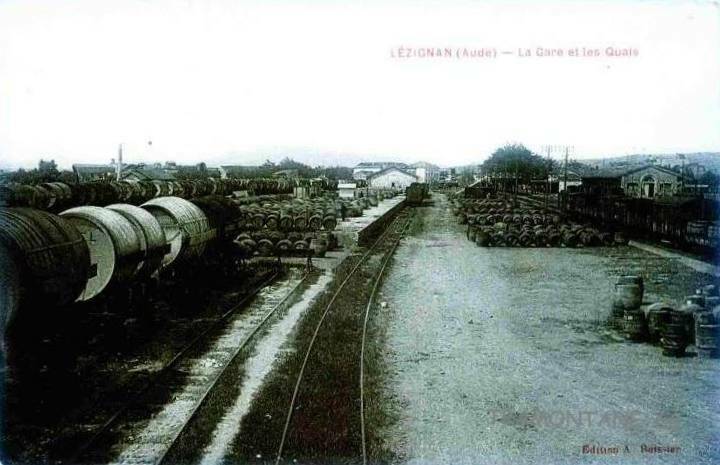 It was a 15 metre span which carried both road and tramway. Its approach retaining walls remain, but the superstructure has been replaced by a modern open- parapeted bridge of a slightly longer span. 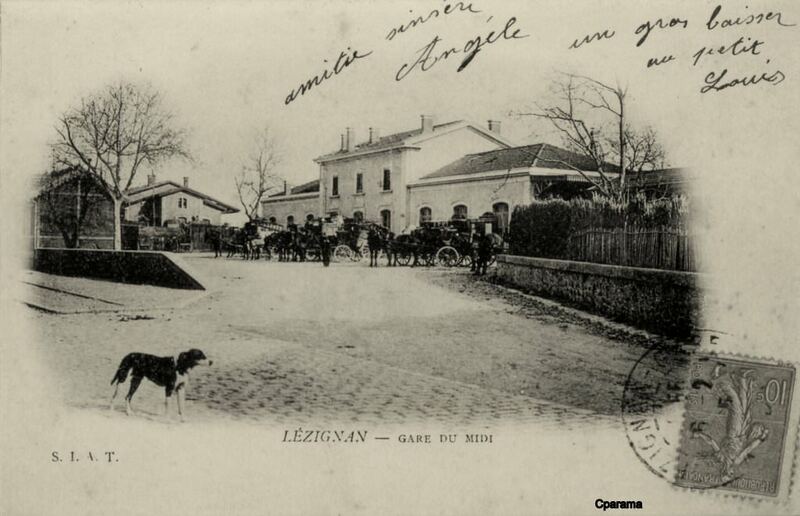 As an interesting aside, I came across this postcard while searching the internet. It is a complete flight of fancy as no standard gauge railway line ever served Homps! 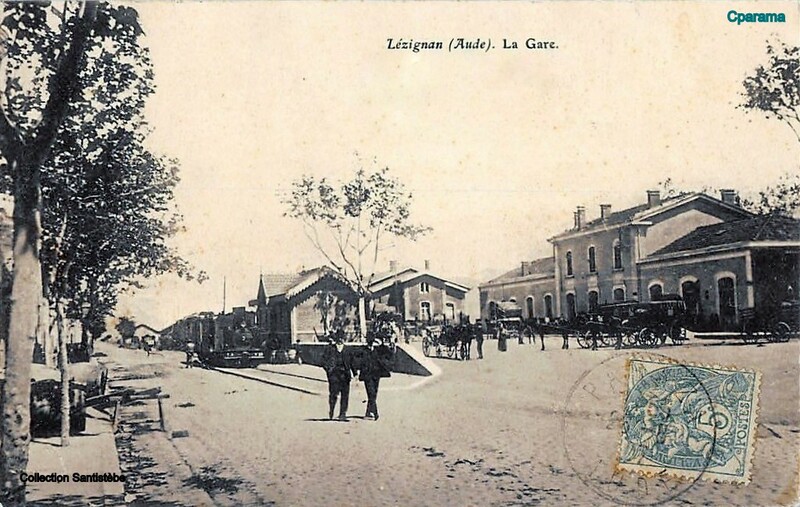 The image on the postcard also seems to exaggerate the size of the village. 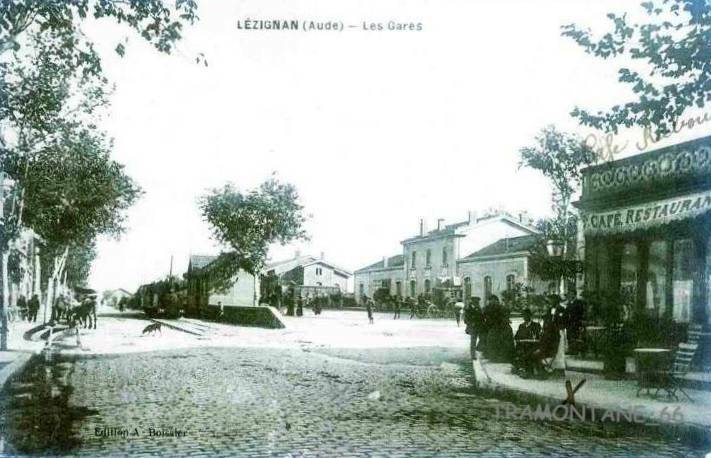 A further search on the internet resulted in a series of postcards for different towns and villages all bearing the same image! 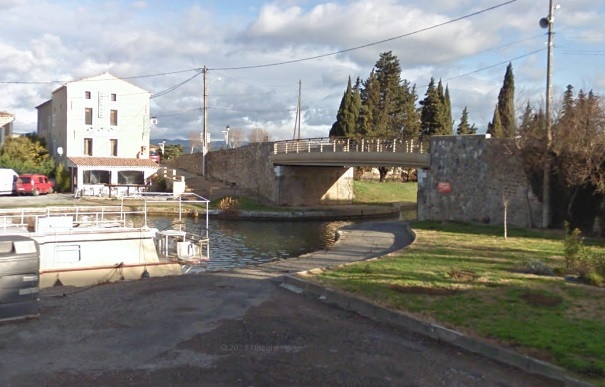 This image was taken from close to the Canal bridge looking into Homps. 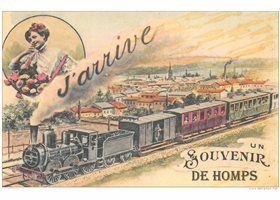 On leaving the old village of Homps the tramway followed the original GC5 (D611, which now-a-days joins the D610), before turning right down the GC11 (D611) and then crossing the River Aude on a masonry viaduct of three 20 metre-span arches. 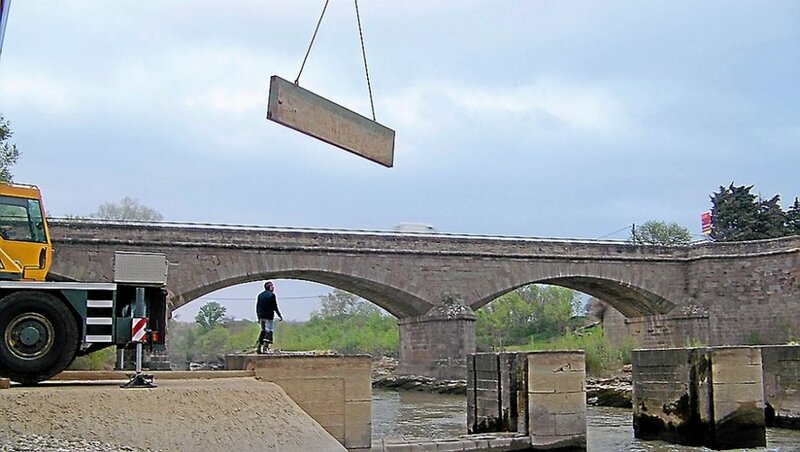 The bridge over the River Aude taken in 2012 during the construction of the wier which improved the water supply to Tourouzelle. The viaduct in 2016. 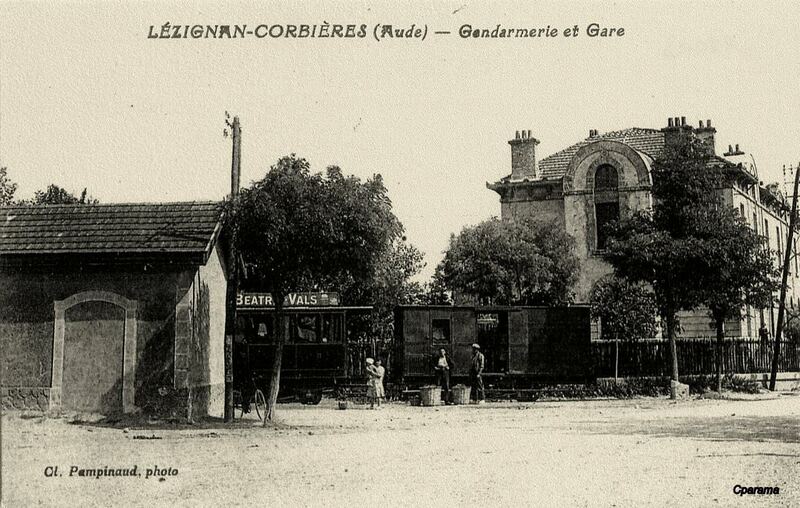 Immediately after crossing the bridge over the River Aude the trams encountered another Halt. 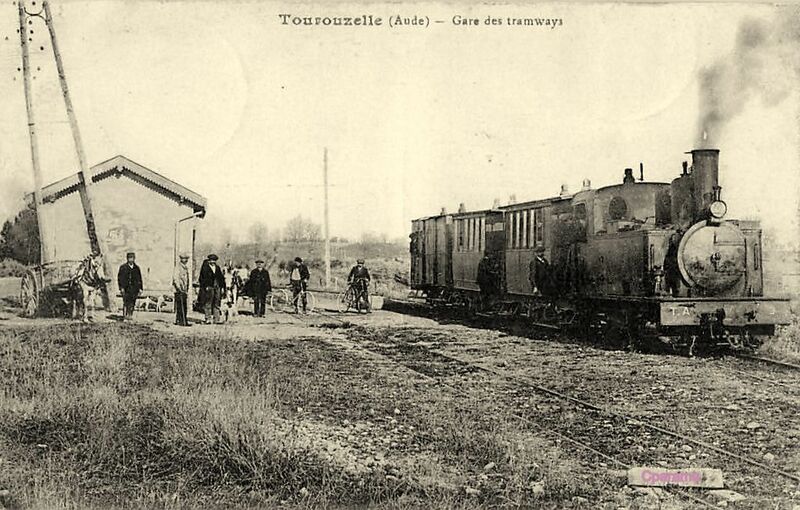 The Halt/Station was close to the hamlet of La Tuilerie to the Northeast of Tourouzelle, and served Tourouzelle. 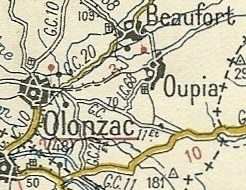 The image above shows the location of the Station for Tourouzelle. 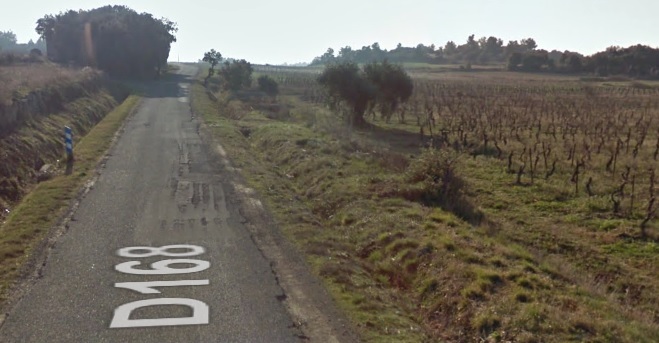 It is, in the 21st century, a kind of lay-by alongside the D611. 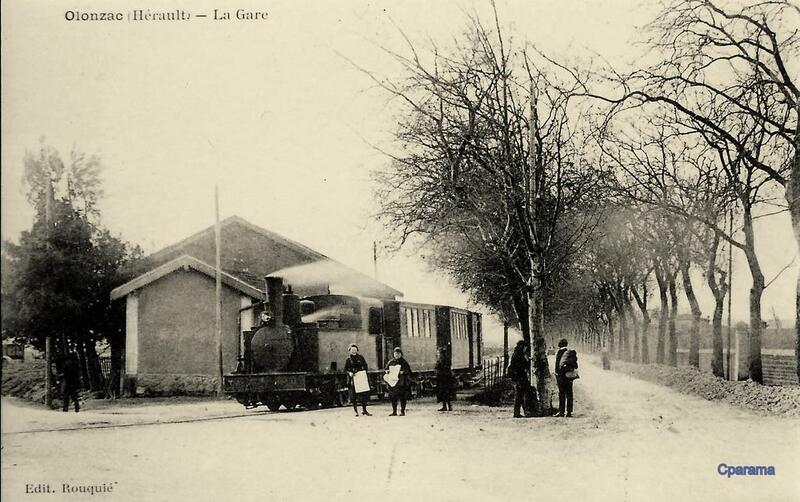 After the station at Tuilerie the tramway follows the northeast shoulder of the GC11 (D611) to Segame (Serame) and on to Montrabech on the GC11 (D11). 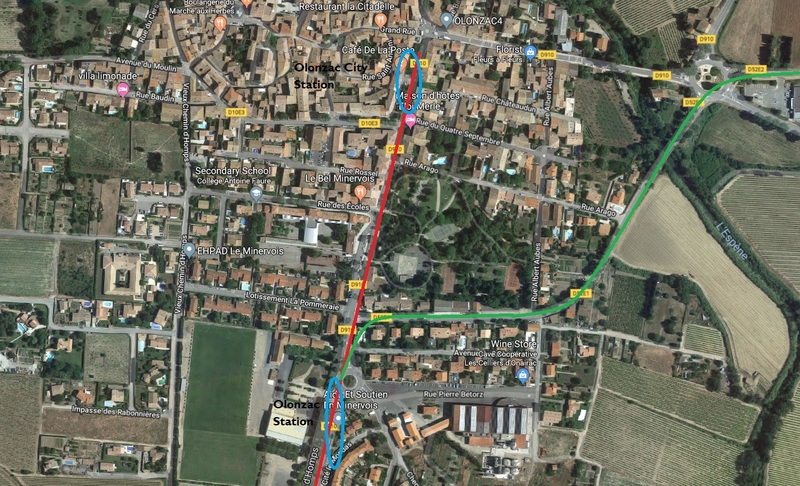 Segame (Serame) was close to Argens-Minervois and Argens was connected to the tramway by a bridge over the River Aude. 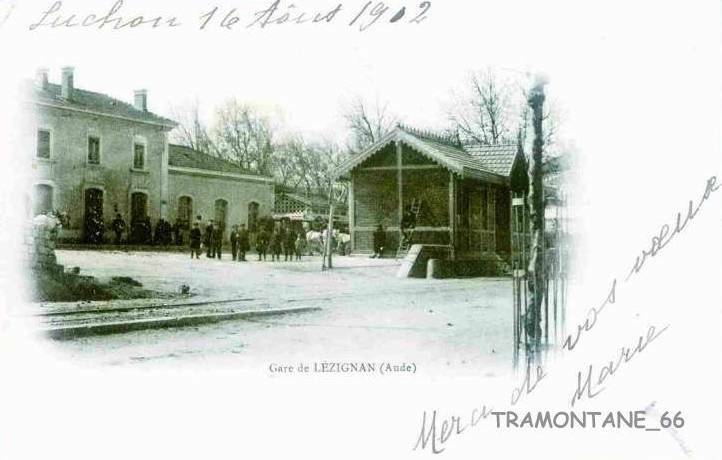 The Halt at Montrabech was known as Lezignan-Montrabech. 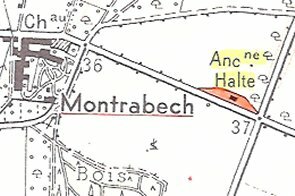 It was to the East of the hamlet of Montrabech. 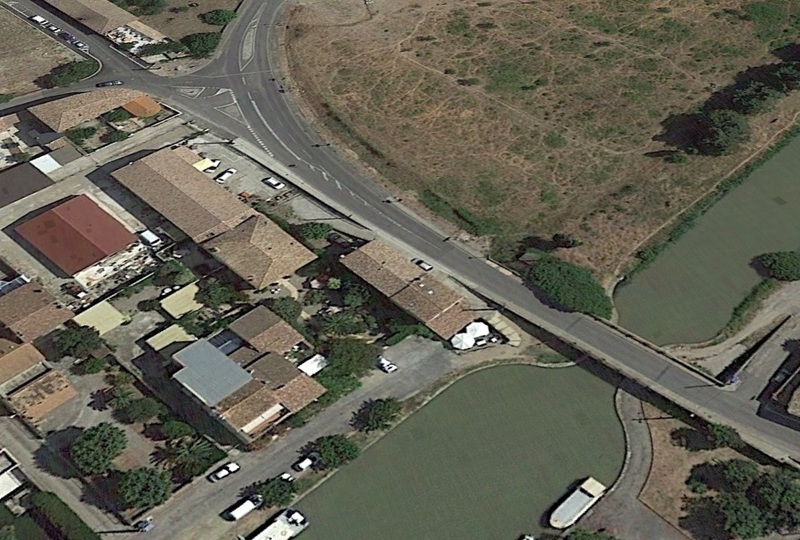 The area of the Station is still visible on the satellite image below. 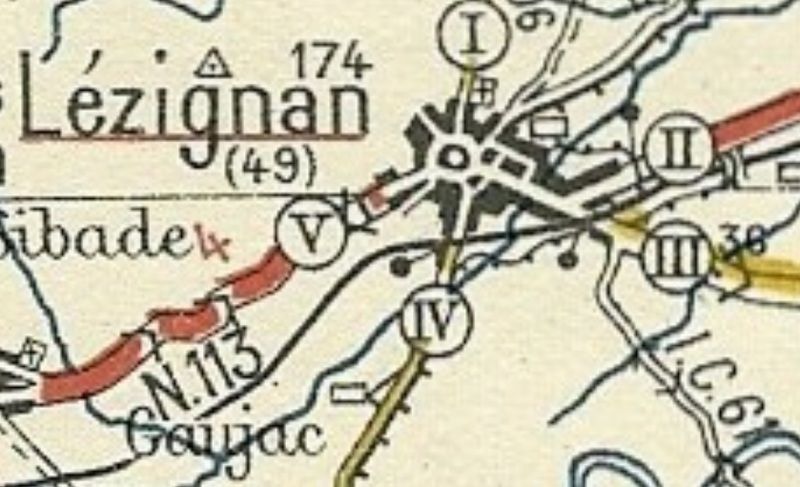 The approximate rail alignment is also shown in red. 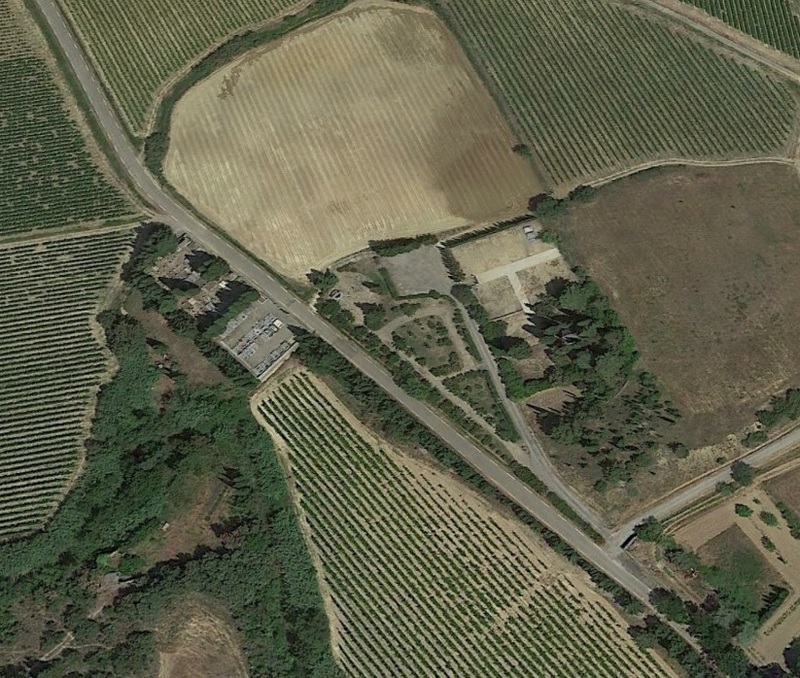 The area of scrub land to the left of the D11, in between the vineyard and the road, is the location of the old station. 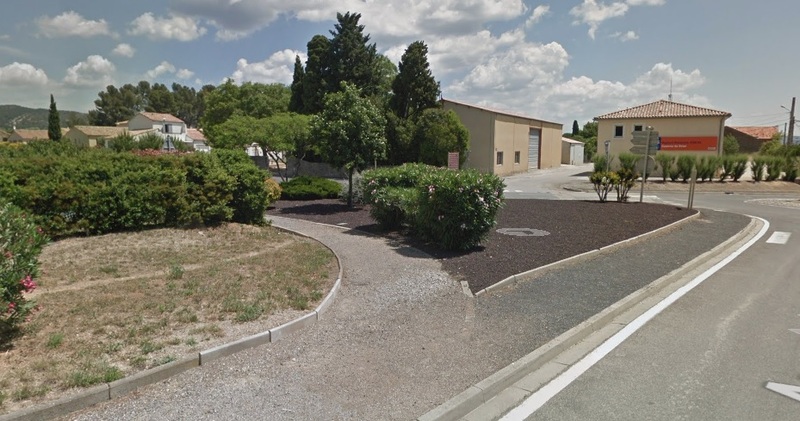 We finish this particular journey in Lezignan! 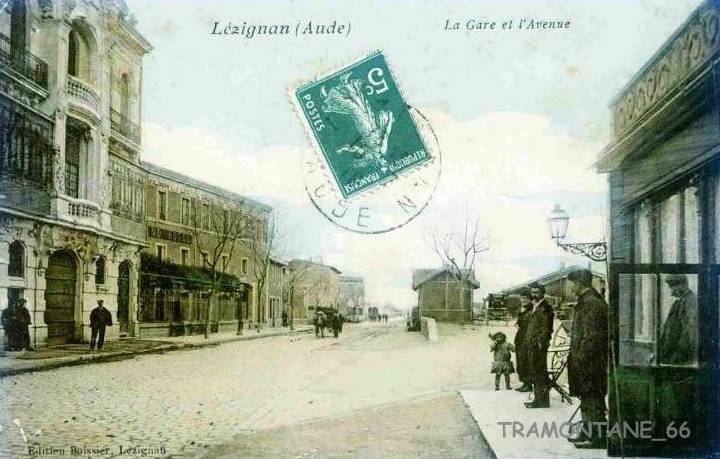 https://www.delcampe.net/fr/cartes-postales/europe/france/34-herault/autres-communes?f=keyword:siran, accessed on 9th October 2018.
https://www.communes.com/ville-siran-34, accessed on 9th October 2018.
http://cahiers.de.minerve.pagesperso-orange.fr/HTML/cdf_lezignancaunes.html, accessed on 25th September 2018.
https://www.delcampe.net/fr/cartes-postales/europe/france/34-herault/autres-communes?f=moyens-de-transport:transports, accessed on 12th October 2018.
https://cahiers.de.minerve.pagesperso-orange.fr/HTML/cdf_hompsminerve.html, accessed on 13th October 2018.
http://cahiers.de.minerve.pagesperso-orange.fr/HTML/cdf_lezignancarcassonne.html, accessed on 25th September 2018.
https://www.cparama.com/forum/olonzac-t197.html, accessed on 13th October 2018.
https://www.cparama.com/forum/tourouzelle-t266.html, accessed on 14th October 2018.
https://www.lindependant.fr/2012/04/11/de-l-eau-de-l-aude-pour-alimenter-le-village,130415.php, accessed on 14th October 2018.
https://www.cparama.com/forum/tourouzelle-t266.html, accessed on 15th October 2018.
https://www.geneanet.org/cartes-postales/view/5928361#0, accessed on 15th October 2018.
https://www.cparama.com/forum/lezignan-corbieres-gare-t28257-20.html, accessed on 15th October 2018.
https://www.cparama.com/forum/lezignan-corbieres-gare-t28257.html, accessed on 15th October 2018. 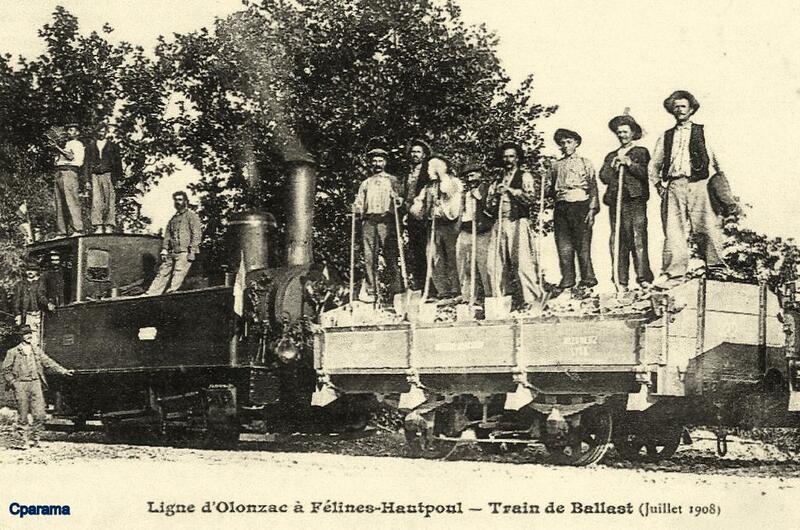 Loco Revue Volume No. 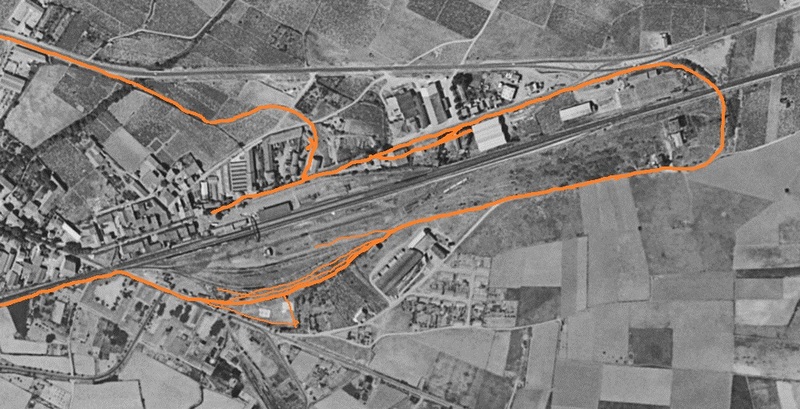 212 November 1961, p385. 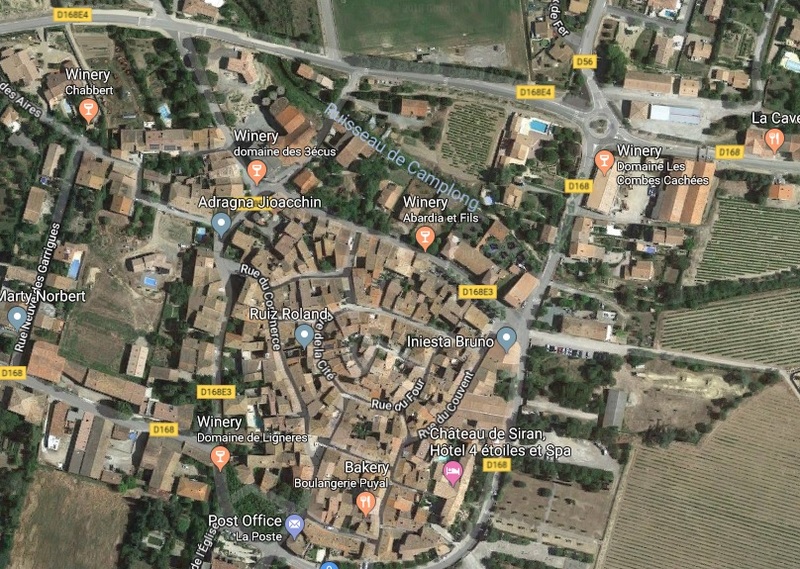 Aerial image provided with the line sketched by Pascal_pmidi on the LRPresse Forum on 1st December 2018. 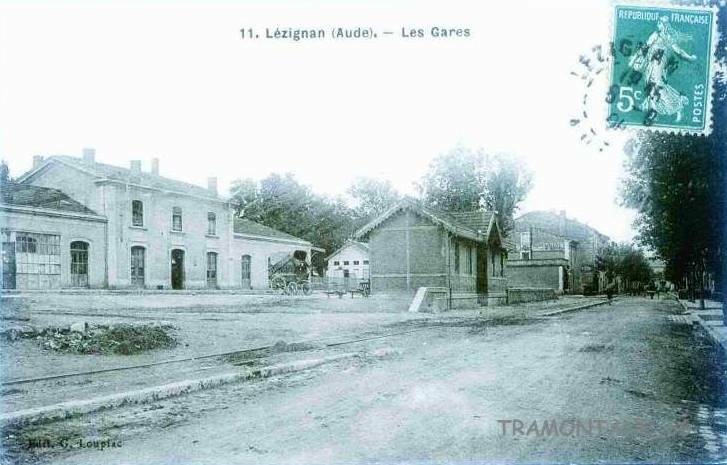 This entry was posted in Railways and Tramways of South-Western France, Railways Blog on October 13, 2018 by rogerfarnworth. 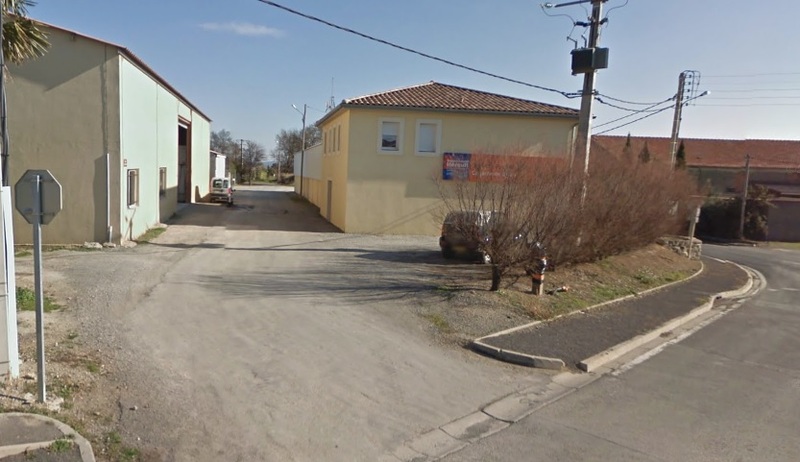 Hello Roger, I was very interested to find your website as I am very interested in the Tramways d’Aude – I have a holiday home in Peyriac-Minervois. It is an excellent site and I look forward to doing my own exploring now I know where to look! One point of interest for you perhaps? 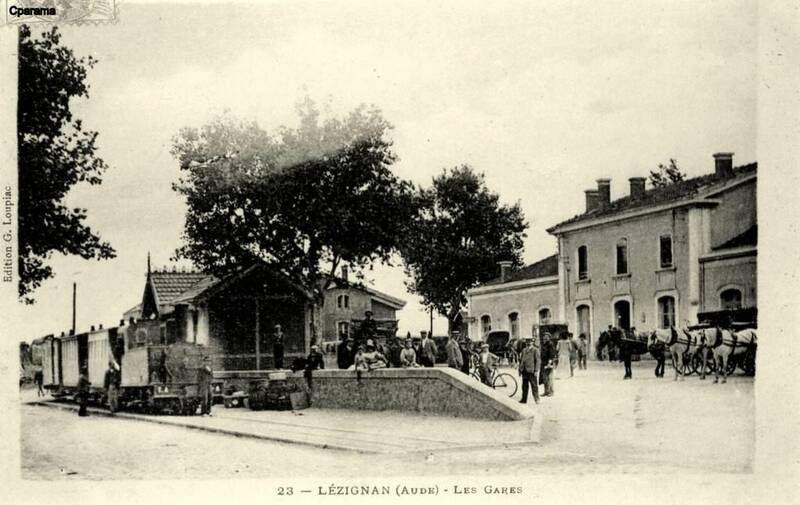 A couple of years ago I visited a craft fair in Pepieux one November and met a chap who models OO gauge and lives in Lezignan. 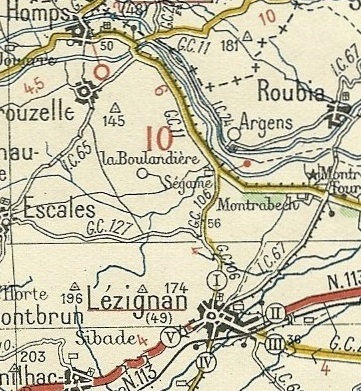 In your section on Lezignan, you show the route in red on a large scale plan of the eastern end of the town. 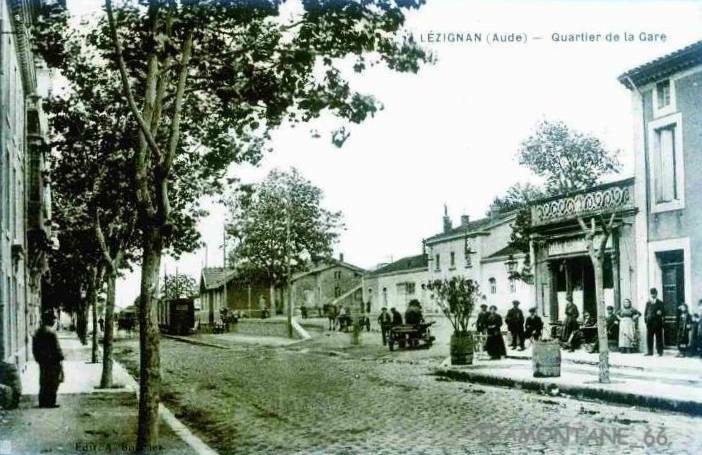 Just south of the point where the line crossed the rue Turgot, are numbered buildings 1 and 4. 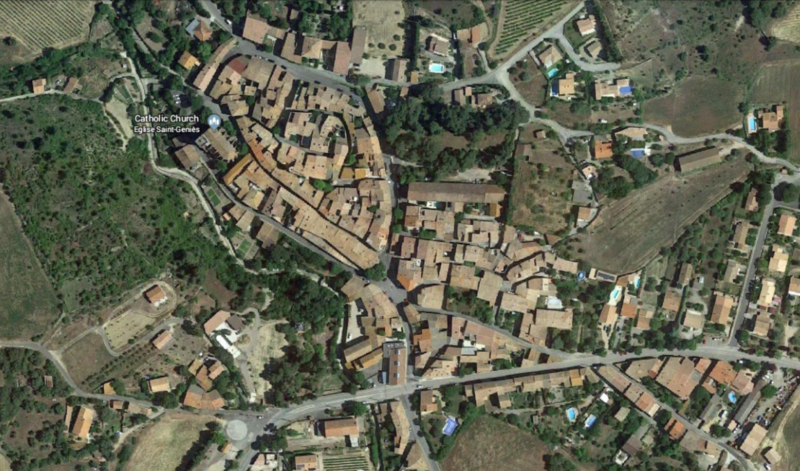 He lives in the one marked 1 and on his property is the un-numbered, angled, building opposite the number 4. 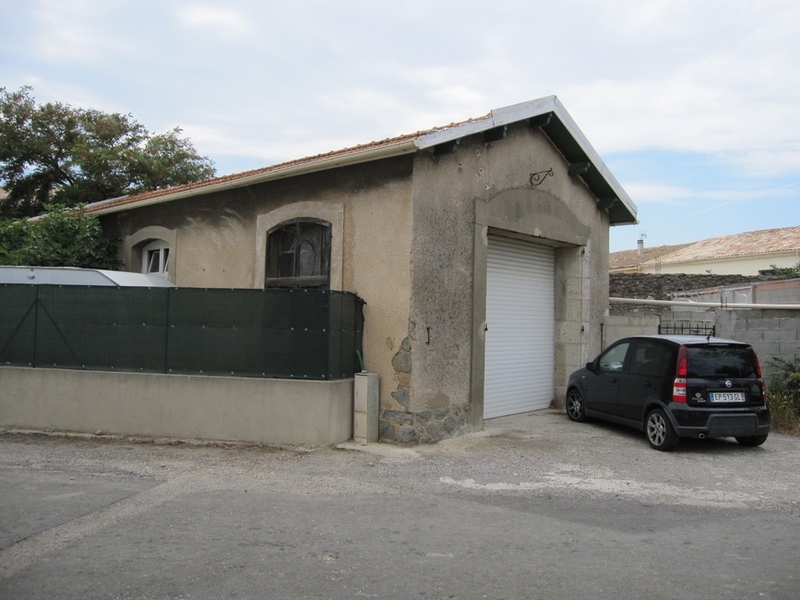 This angled building was the carriage shed for the tramway and he has built a mezzanine inside for his model railway, with the ground floor being converted into a Gite. 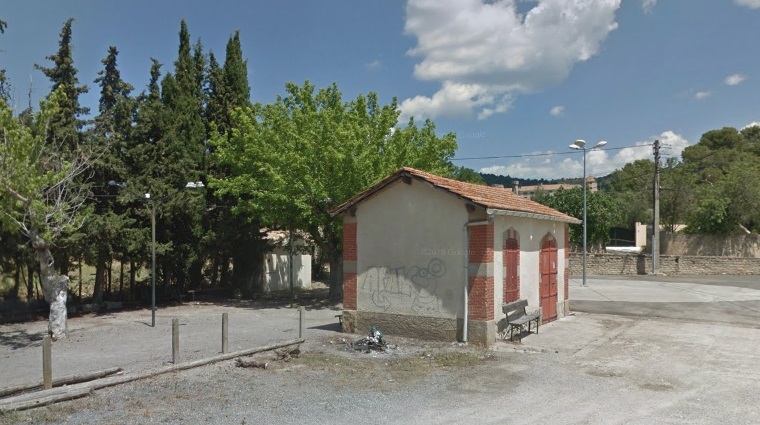 So another building still survives, albeit modified internally. 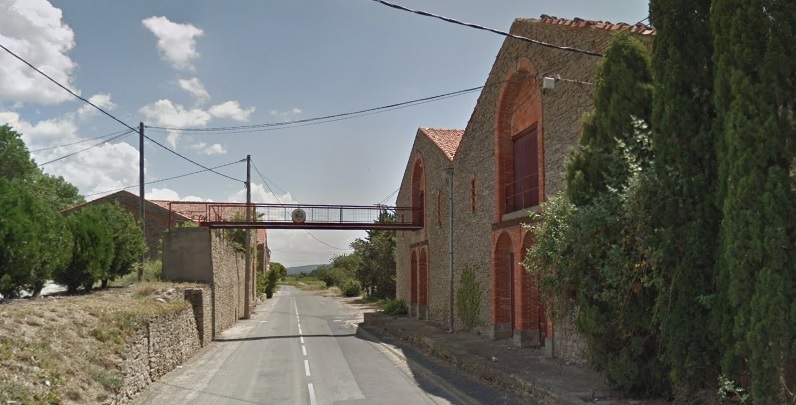 Should be able to find a view on Google streetview perhaps? Thanks for your comments. 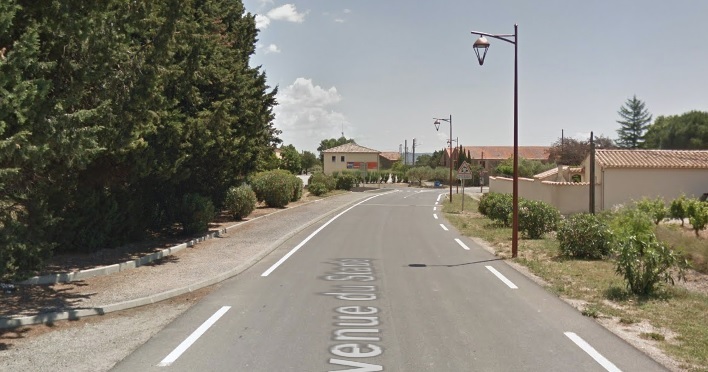 I have tried to follow this through on Streetview but the street view images stop short of the location on Rue Turgot and I cannot see what you mean from the street view images on the main road. However, what you say is certainly really interesting. I am glad you appreciate the blog.